My objective was to digitize a collection of about 190 cylinders. This collection resides in a six-drawer chest that supports an Edison Amberol 50 phonograph (introduced in 1915). The phonograph and cylinders were in a fairly benign environment for their first 30 years or so; however, for the next 40 years, they were stored in an uninsulated building subject to temperatures between minus 20 and plus 110 degrees Fahrenheit. I've had the phonograph in my home for the last 20 years during which time it been cleaned, restored, and occasionally played. The condition of the cylinders is a mixed bag: some warped, some scratched, all worn. All are four-minute, 160-rpm cylinders; most are Blue Amberol. This simplified my player requirements to one speed and one size mandrel. The player is made of wood, common hardware, and scavenged parts. 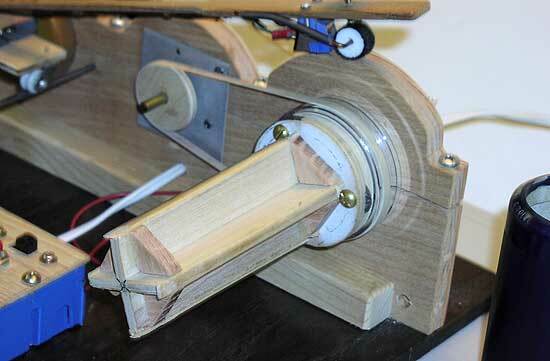 The "lathe-less" mandrel, constructed of ¼-inch plywood, is mounted on a rotary head motor scavenged from an old VCR. I slightly undersized the plywood fins of the mandrel and glued balsa strips on the edges. These were then sanded to size starting at the outer end by using a cylinder to progressively check the diameter. I would also rotate the mandrel by hand using a square set on the player base to check that the fin edges were equal in radius at points along the mandrel’s axis. 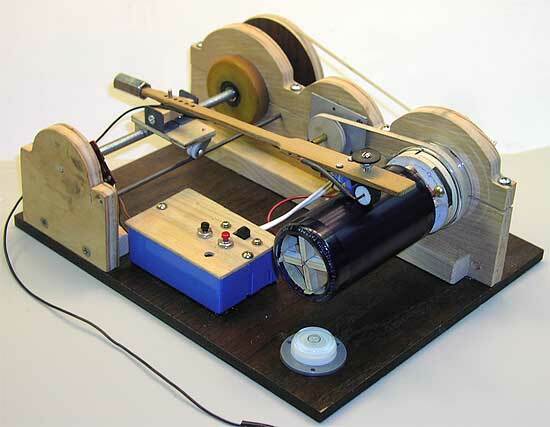 The drive motor, scavenged from an Acoustic Research XA turntable, runs at a synchronous 300-rpm. I used a scroll saw to rough cut the drive pulley, then spun it in a drill to sand it to size such that the rubber band drive belt turns the mandrel at close to 160 rpm. 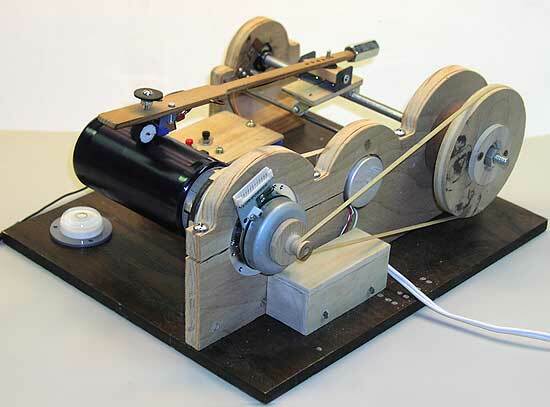 To check the speed, I made a small scratch on the unrecorded portion of a cylinder and used audio software to measure the time period of eight clicks or rotations. 160 rpm would result in a measurement of three seconds. My measurements using audio software are consistently a bit over three seconds and correspond to speeds between 159.3 to 159.5 rpm, a variation I attribute to rubber band drive belt slippage, the inexact size of the drive pulley, and how well I can read the time between first and last click. An option is to cut a new drive pulley to get closer to 160 rpm. In any case, the current speed is close to spec and better than the old spring-driven Edison phonograph that runs just over 158 rpm. The bottom of the tone arm platform has two half nuts that ride on an 18 threads per inch, 5/16 inch diameter rod, and a small front pulley wheel that rides on a smooth rod parallel to the threaded rod. The threaded rod's bearings are an old roller skate wheel on the driven end and a bearing popped out of a roller skate wheel at the other end. A couple of wraps of electrical tape give the rod a snug fit within the bearings. The pulleys turning this rod are sized to translate a cylinder's 200 grooves per inch to the rod's 18 threads per inch, an approximate 11:1 ratio. After cutting and sanding the large pulley close to planned size, I cut the smaller pulley from a wood dowel, spun it in a drill, and used files to reduce it to size. This pulley and the one on the drive motor are slightly crowned which keeps the rubber band belts centered. I started with a thin balsa tone arm and adjustable counterweight similar to conventional turntable tone arm design. However, out-of-round cylinders generated too much vertical motion. So I switched to a larger arm and mounted a dust cleaner to the end of the arm to hold the phonograph cartridge at a fairly constant distance above the cylinder's surface such that only the cartridge stylus moves relative to the cylinder track. (Any dust removal from the cylinders is a side benefit.) A counterweight keeps the dust bug from generating too much friction on the cylinder that can stall the motor. The XL-20 cartridge is borrowed from a Sony turntable. The drive motor uses 60-Hz household current. I use a relay for motor on/off. This relay is closed by another relay that latches on (red button) or opens (black button) using low voltage from a wall wart transformer. Another, normally closed leaf switch toward the end of the tone arm’s linear travel also turns off the motor and, being exposed, is the primary reason for incorporating the low voltage control circuit. The stereo phonograph cartridge coils are connected in series and run to the microphone input of a Griffin analog-to-digital converter. Its USB output connects to the computer where cylinder music is processed and stored using open source Audacity® software. The Audacity® software (from SourceForge.net and Google Code) provides filtering, equalization, and other effects. Click removal and noise reduction are especially useful. Thomas A. Edison No. 4226 "Palesteena - Foxtrot" by Green Bros. Novelty Band, released in 1921, as played on Ed Olson's player. Note that the mandrel seems to be turning in the wrong direction. This is just an effect produced by the frame rate of the movie.